The second day I was there, I mostly did video on the near shore barrier reef, so I really don't have much more in the way of good pics from there. Not to worry, well progress straight out to the outer islands. One of these days, maybe I'll try to get some stills from the video and post them... but don't hold your breath. Actually, it was really fun though. I was diving with Amigos Del Mar and while they like careful divers that don't mess with the local life, I think that they thought I was funny. They don't like divers leaving the little group, but they figured I'd make it back without hurting myself or, more importantly to them, any of the local life. 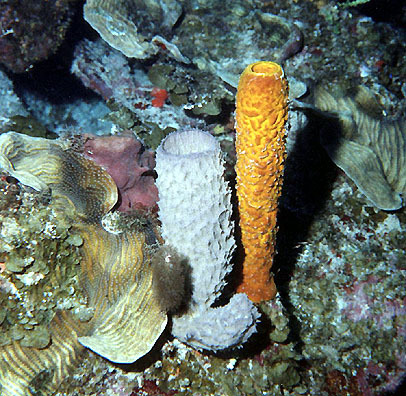 So anytime they saw something interesting (they were good spotters), they would point it out to me and I'd go charging off across the reef at full hunting speed, with my video camera in front of me like a 2 handed bangstick. I think the fish there recognise cameras pretty well, cuz they were easy to approach without spooking. They sent me down one of the little canyons at the outer edge of the reef after a ray. It was an interesting dive. The canyon is about 35 feet deep and only about 18 inches wide at the bottom. To control myself and not touch the sides, I had to spiral down. It was a challenge for control. Oh, if anyone cares, I notice that on Thursdays pic list, is actually a fairly closeup picture with me in it... (chuckle chuckle) something not yet seen on my web site. Anyhow, I was scheduled for a 3 day liveaboard to the 3 outer islands. This was what I was waiting for. The diving was supposed to really be an experience. I was not dissappointed. 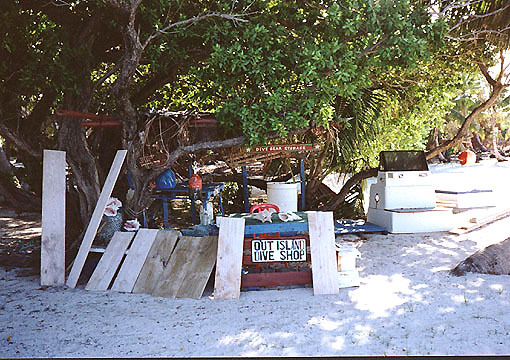 Here is a picture of one of the local dive shop annexs. Do not expect to find much in the way of parts to fix your camera or regulator here, but I love the location and ambiance. 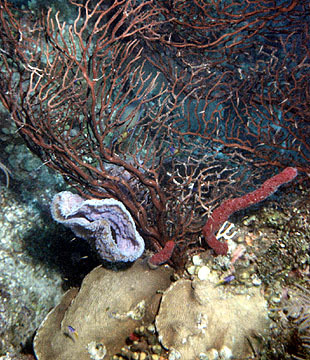 Here's a shot of one of the lavender sponges, that came out with pretty good color. At one point I had been swimming along over the reefs for a bit and while they are seriously lush and beautiful, I really wasn't seeing much in the way of photo ops. I was saying to myself 'give me some composition'. 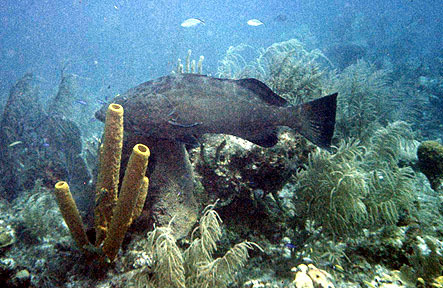 Immediatly, I see this nice sized grouper behind a yellow sponge. He didn't allow me to get any closer, but I did get this shot. To me, one of the more interesting things that I actually hoped to see was a crinoid. 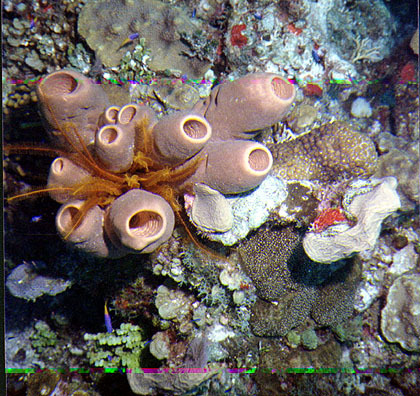 This one thoughtfully perched nicely on a pink sponge for me. Composition, composition, composition and maybe a better camera.